A Self-Service business intelligence software allows you to Discover Trends, Track KPIs and Visualize data. Connect to multiple data sources, create and schedule reports, set alerts and run predictive analytics with our drag and drop GUI. As a Self-Service BI Software, StarBI empowers business users by turning data into actionable insights and enable organizations to improve on decision making. StarBI is preloaded with various industry specific reports, dashboards and predictive models enabling the customers to derive Business Insights from the raw data efficiently and from day one. Desktop based designer, where you connect multiple data source, create interactive visualization and run predictive analytics with our drag and drop feature. Highly secure web portal. Role based user access to filter the data. Individual and Batch scheduling, KPI Alerts. Easy Sharing and Collaboration with other business stakeholders. Desktop based application to view StarBI Dashboard (.XML). View multiple dashboards with all the interactivity like drill down, filter... Easy sharing and collaboration with other business stakeholders. 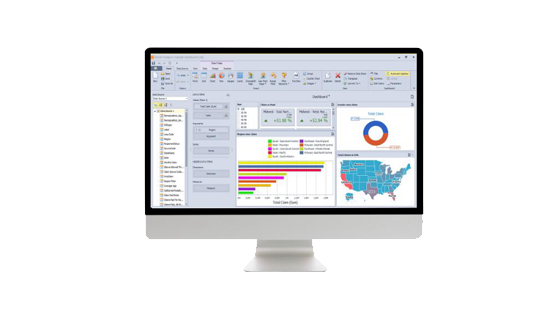 Starcom flagship product for enterprise self service business intelligence - StarBI, allows you to discover trends, track KPIs and visualize data. Connect to multiple data source, create and schedule reports, set alerts and run predictive analytics with our drag and drop GUI.